Andy White released a mini-album called “troubadour” to sell it on his recent tour and via post order. The CD contains a song, Andy wrote during the WOMAD summer school I joined this summer. 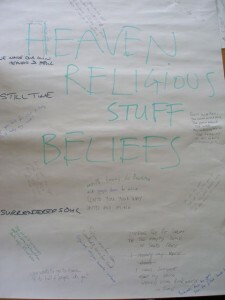 The lyrics contains a lot of phrases, which result from our brainstorming session. 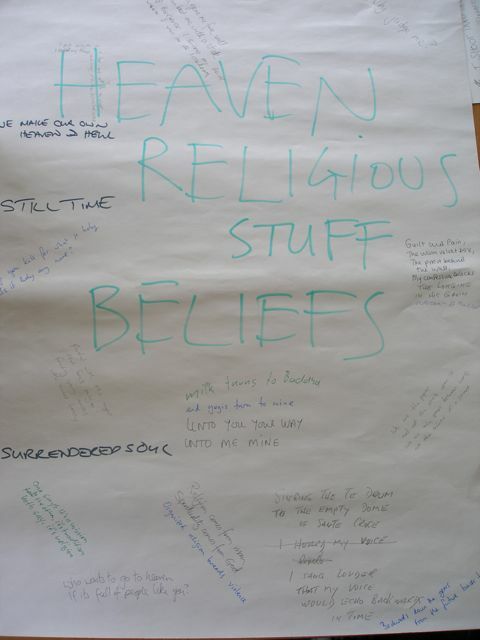 Every participant of the songwriting workshop scribbled down, whatever come to mind to different topics such as “love” , “biography” or “heaven, religious stuff, beliefs.” So I contributed with some words to an Andy White album. Cool. I don’t really know the name of the song. Something like “Wanna write a love song like nobody else” I guess. He already performed the song in Bath during the workshop. It is fun. So I’m dying to hear the album version. Hope I can get a copy of the record.I’ll tell you as soon the song is published somewhere on the Internet. This entry was posted on Tuesday, November 11th, 2008 at 8:12 pm and is filed under art/kunst, Johann Strube. You can follow any responses to this entry through the RSS 2.0 feed. You can leave a response, or trackback from your own site. That song is amazing! It has lines from every single one of us and turned out so clever, can’t wait to hear the recorded version!! !